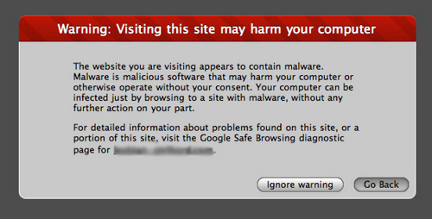 Question: Google flagged my website as containing malicious code. What can I do to fix it? Answer: Many people assume that they have a security breach in their server if Google flags them. While this is sometimes true, it is often a much easier problem to fix. If you are running Microsoft Windows on your home computer or if you have dedicated server hosting multiple websites, you may have a virus attached to files on your website. Any user with FTP access to your server is a potential weak link and could be responsible for unknowingly uploading a virus. Since you cannot possibly police each one of them and force them to keep their computers clean, the best you can do is install anti-virus software on your server. If you are using a shared hosting account, check with your provider and also make sure you have anti-virus software running on your home computer. For Linux servers, ClamAV is the popular choice for virus scanning. Although it runs on Linux, its primary function is to find and quaranteen Windows viruses. It is free and open source software, available in most distribution repositories.